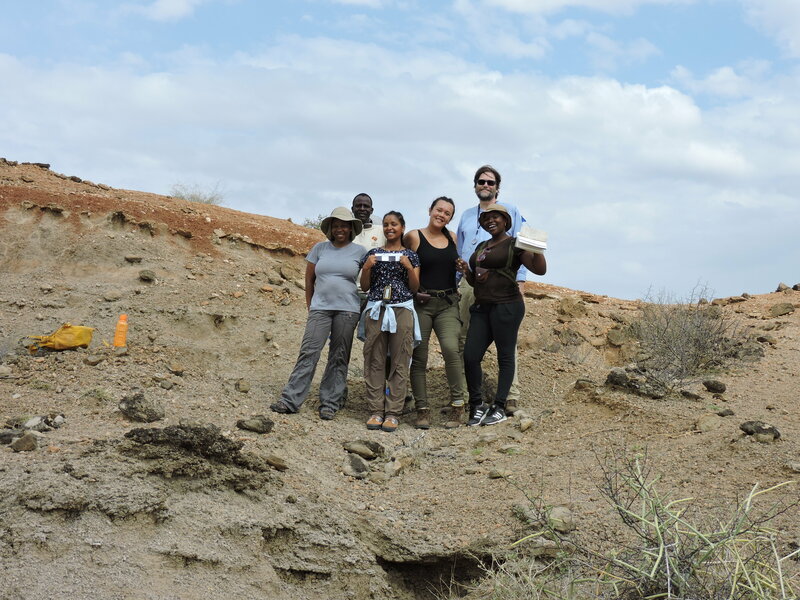 We are in the fifth week of the 2015 Fall Origins Field School and we have started out third module: Vertebrate Paleontology! 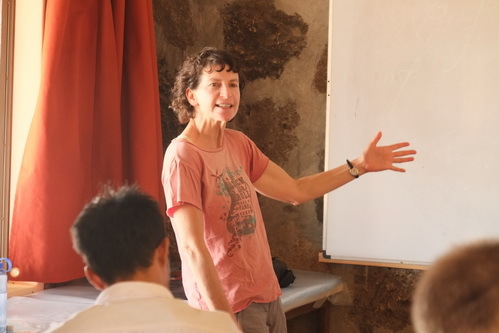 In this module, we have our new instructor Dr. Ellen Miller from Wake Forest University. 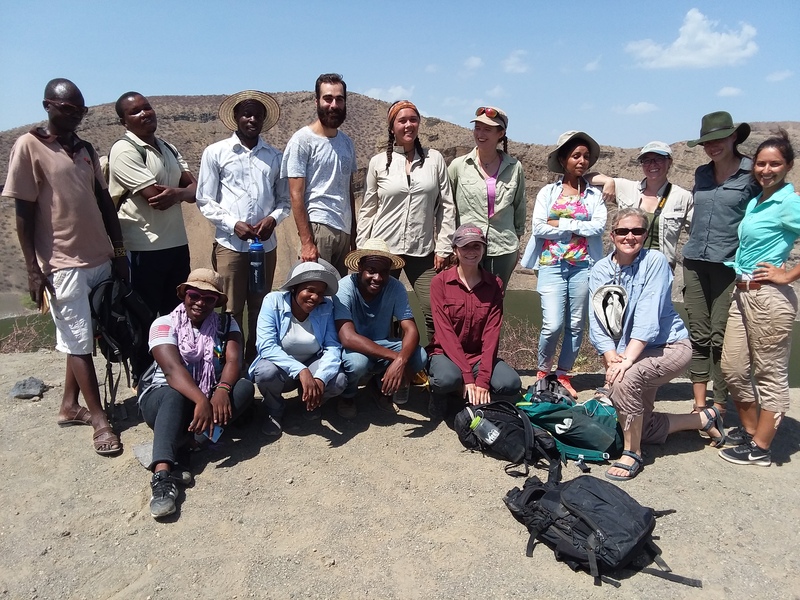 Dr. Miller has been working in the Turkana Basin for more than a decade and had incredible field experience in Egypt and Wyoming. Her expertise is fossil mammals especially fossil primates from the early Miocene. 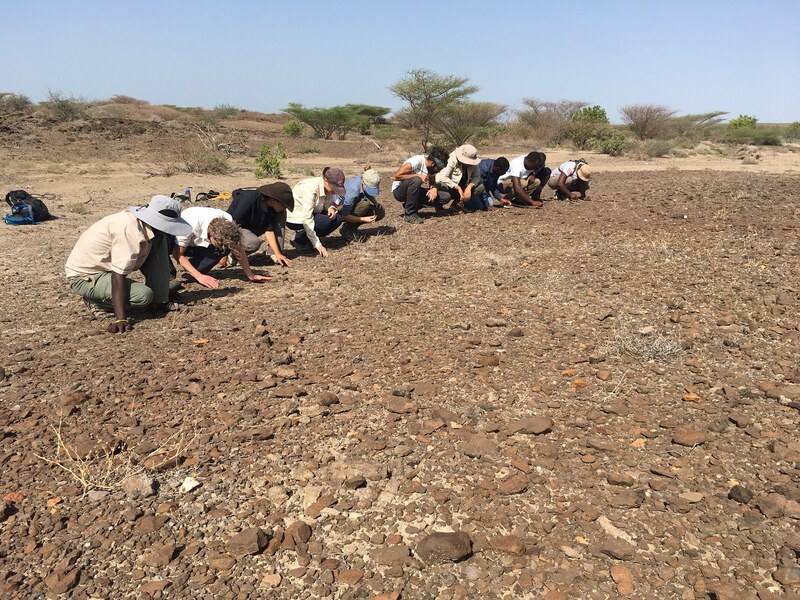 The most exciting part of this module is that students are going to have first-hand experience of field excavation and learn about field related methods at the fossils site called Buluk, where Dr. Miller has been working for a long time. Want to know more about the three-day camping trip? Stay tuned! 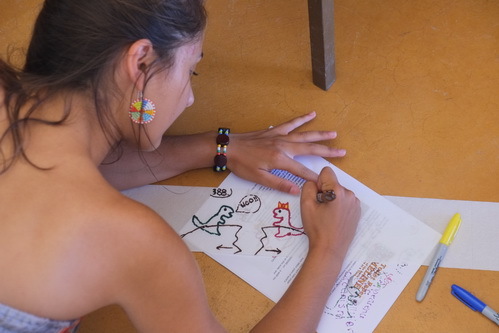 In the first couple of days, students learned about how evolution works starting from Darwin all the way to the modern evolutionary synthesis. 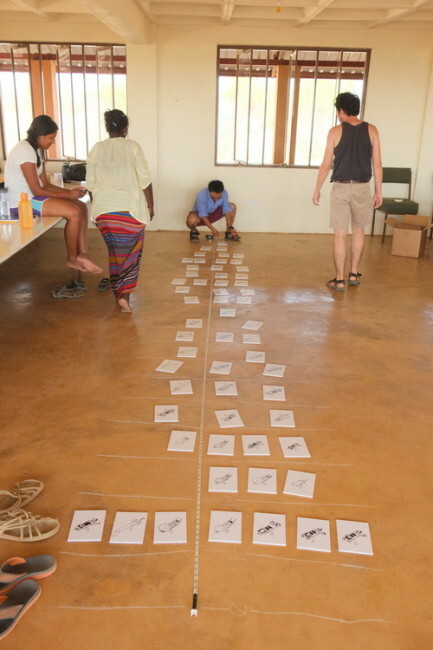 We started with some early concepts of how species change over time and how they developed into genes, diversity, selection, and speciation as we know today. Evolution is about change and time. I mean a lot of changes and a lot of time! 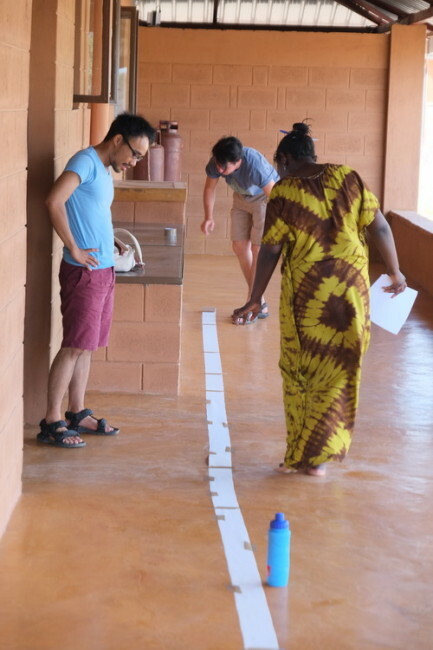 So to appreciate the vast amount of time in the history of the earth through which organisms went from simple to complex, from uniform to diverse, we did a fun exercise called the “Toilet paper timeline”! 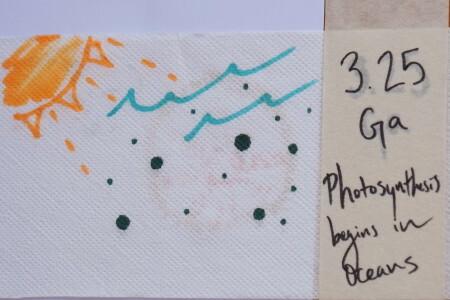 In this exercise, the earth’s history from its birth 5 billion years ago to today was visualized on a roll of toilet paper. 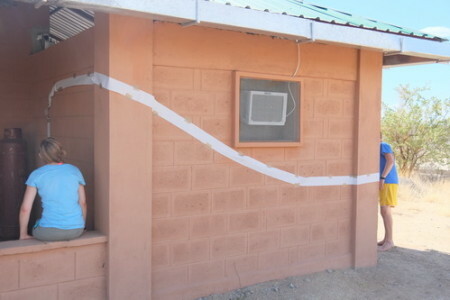 If we divide the 50 billion years by the 400 squares in one roll of toilet paper, we have 12.5 million years of earth’s history in one square. 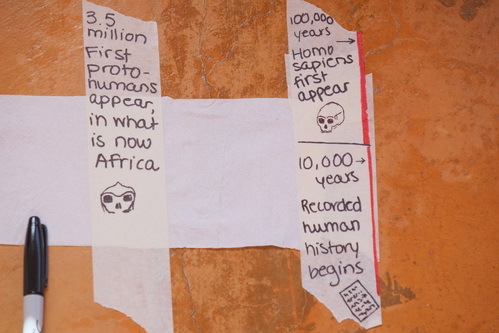 If you do a little bit of math, you will find that anatomically modern humans first came out on the last square just 1mm before the end of the full roll! 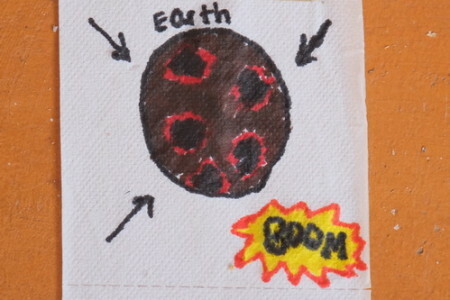 There are other major events in the earth’s history which the students were asked to draw. They include the beginning of all life, breaking up of the supercontinent, extinction of most dinosaurs and so forth. Not surprisingly, we ran into some serious space issues because 400 squares of toilet paper is very long! Take a look at some of the most creative interpretations of major events in the earth’s history! 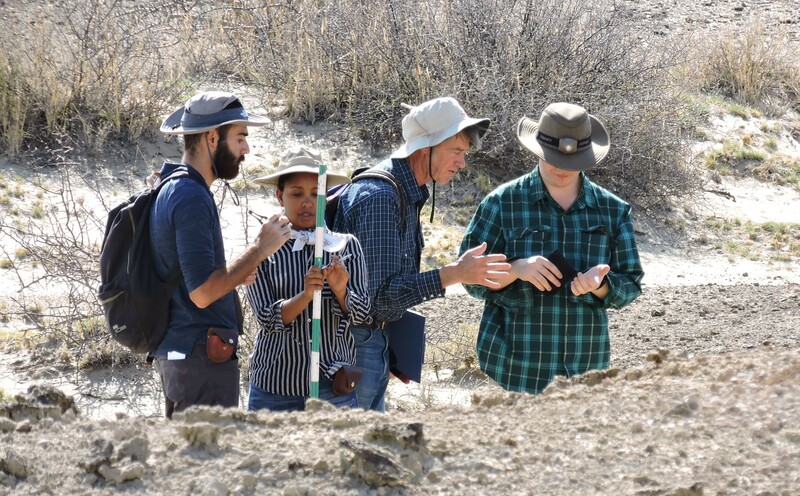 Kenneth, Laura and Taylor brought the Earth’s history into the classroom! All the way around the kitchen! 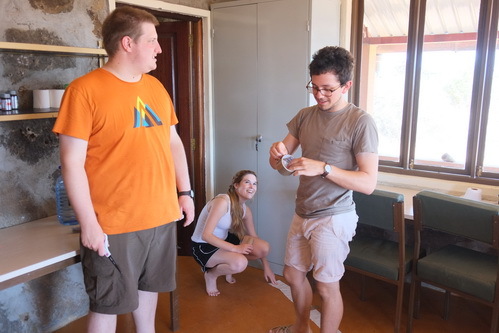 After a good discussion of evolutionary theories, we also learned about species concepts and systematics: how scientist group species together. Dr. Miller went over different philosophies in systematics and how they have influenced our practice of classification and taxonomy. 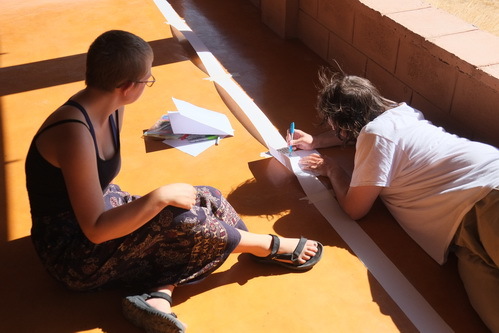 Students had a heated debate about which camp of philosophy they prefer, and obtained a good understanding of where the field is moving into. 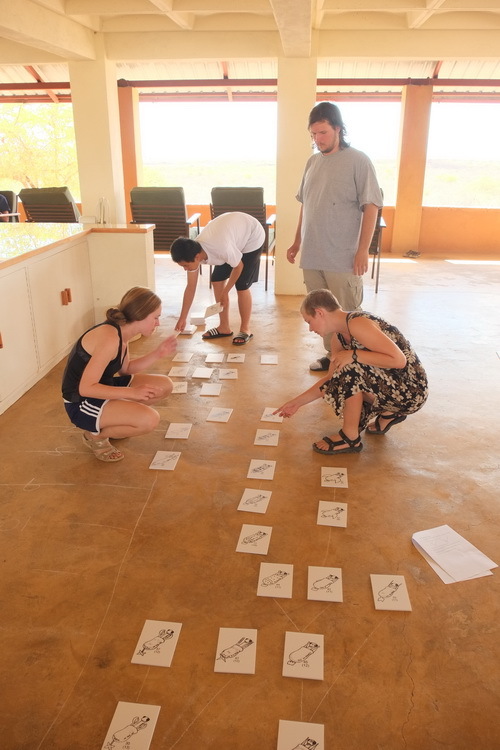 As a follow-up to species and systematics, we had another awesome exercise about the phylogeny of the caminalcules! 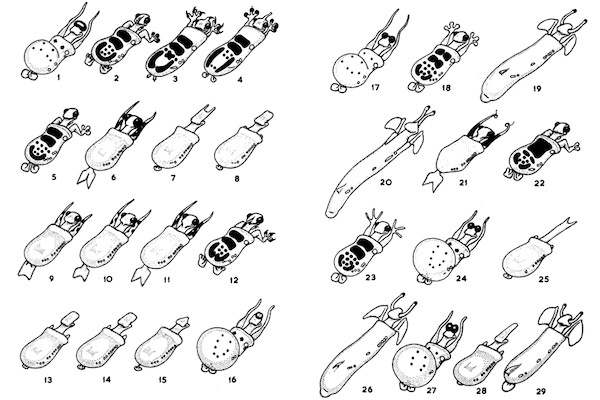 Caminalcules are imaginary animal-like organisms invented by Professor Joseph H. Camin (hence “caminalcules”). They have been used in biology education to teach the principles of systematics and evolution. 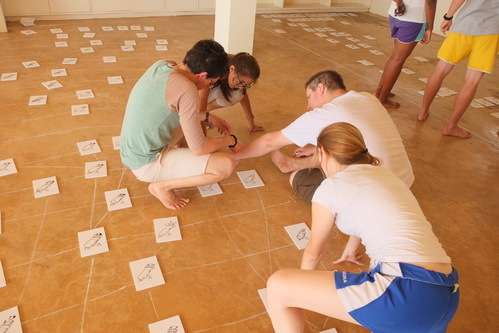 Dr. Miller kindly printed all the images of caminalcules and brought them to Ileret! Kudos, Dr. Miller! Students had great fun handling all the features they can identify in the animals. 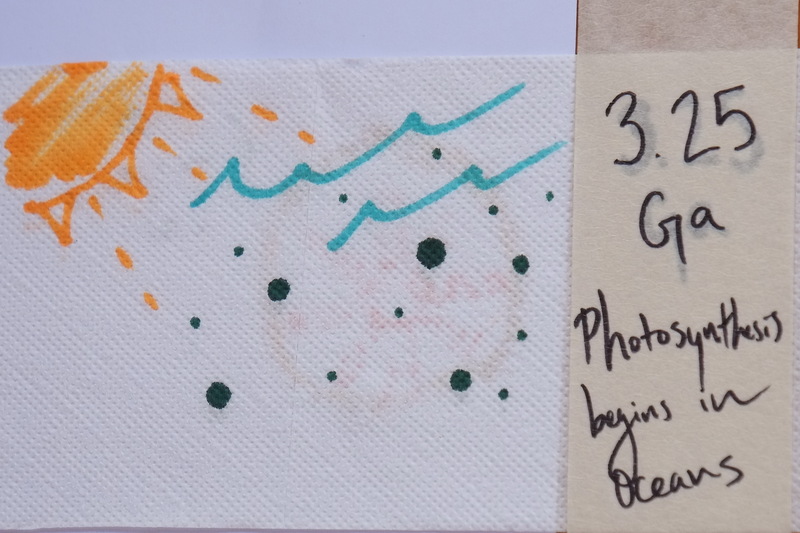 Based on what features are ancestral and what features are derived, students could figure out how these adorable little organisms are related to each other. The goal was to reconstruct a phylogenetic tree that link all the living and fossil caminalcules together, just like what paleontologists would do based on evidence from extant and fossil organisms. Again, we really put a lot of thought in there! 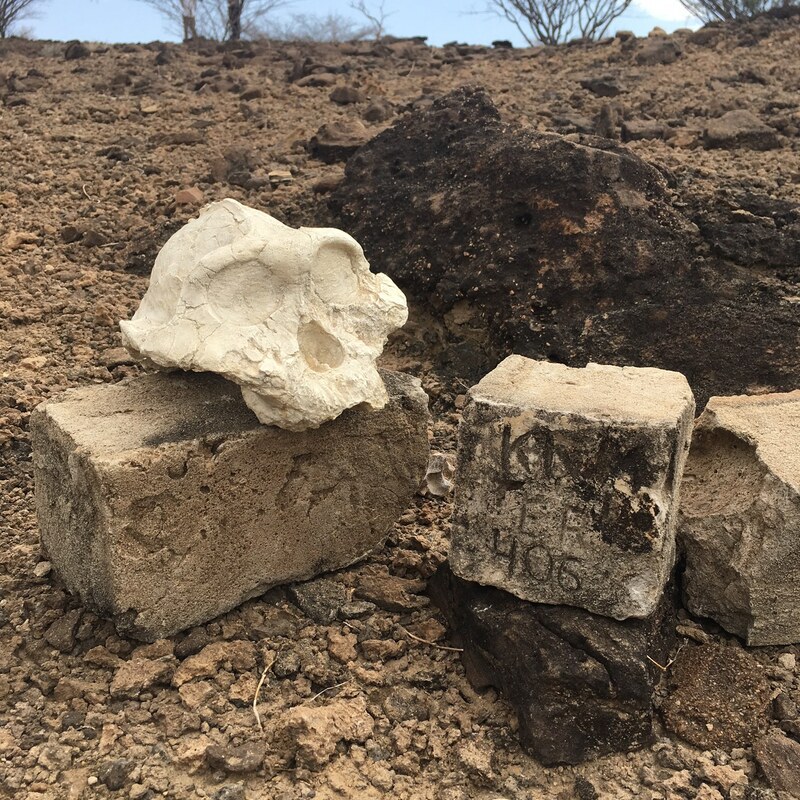 In the next few days, we are going to look at bone morphology and some real fossils from Buluk! Stay tuned!